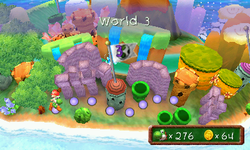 World 3 is the third set of stages in Yoshi's New Island. It takes place in a jungle, which is similar to the previous world, but this world's coloration is more bright. Kamek and King Clawdaddy are the bosses of this world. Rise of the Nasty Nep-Enuts: This level features Nep-Enuts. Ukiki Jammin': This level features Ukikis. Harry Hedgehog's Labyrinth: This level features Harry Hedgehogs. Slime Drop Drama: The fifth castle of the game. Don't Fear the Spear: This level features Spear Guys. Ukiki Trouble in Clawdaddy Cove: This level features Clawdaddies. Lose the Lunge Fish: This level features Lunge Fish. King Clawdaddy's Sewer Castle: The sixth castle of the game. Ride the Blarggwich: This level is centered around a Blarggwich. Fine Feathered Friends or Foes? Make Way for King Bowser! This page was last edited on October 12, 2017, at 06:27.